With great fanfare, the Outdoor Industry invited the public a few days ago to join them in a press conference where they would announce their support for President Obama to designate the Bears Ears National Monument. 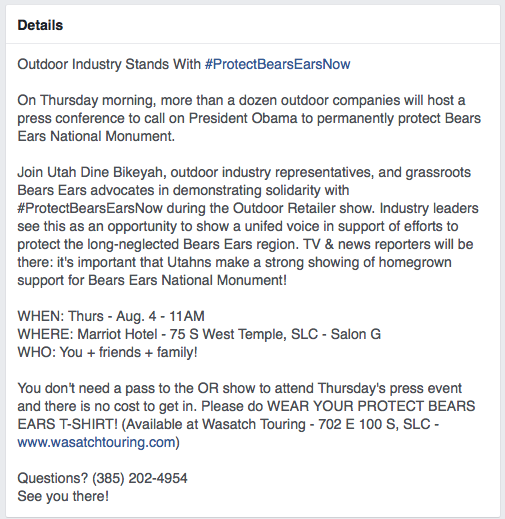 What started as an attempt to show “a unified voice in support of efforts to protect the long-neglected Bears Ears region” turned into a master class on how to not run a PR event in the age of the smartphone. Blinded by hubris, the Outdoor Industry and Dine Bikeyah seemed to think that only ardent supporters of the proposed national monument would show up to a press conference where a bunch of millionaires representing billion dollar companies would use their special access to the Obama Administration to call for a monument designation that would cut off access to land and natural resources in one of the poorest counties in the country. These women were surprised. They were so surprised, in fact, that they did what any self-respecting, smart-phone-wielding, First-Amendment-Exercising citizen would do. They recorded how they were being treated. The clip is only 90 seconds and worth watching in its entirety, but here is a quick summary: The man in the video is a security guard who is performing the thankless job of telling a group of women and their children who are members of an aggrieved ethnic minority group that they are not welcome to attend an event that was advertised as open to the public. He begins by explaining that a Facebook post published by the group hosting the event inviting the public to attend the event wasn’t an actual invitation to attend the event. At the 17 second mark he actually says, “I am asking you very politely to just go out to the sidewalk, where it is supposed to be public property.” Or in other words, can’t these women just go to the back of the bus and not create any trouble. At the 32 second mark he claims that he doesn’t know who the “Facebook page” author is. Well for those keeping track, it was Dine Bikeyah’s page — the group that was hosting the event he was policing. At the 39 second mark another woman walks into the shot, and the woman who is being denied access asks her how she was invited to the event. 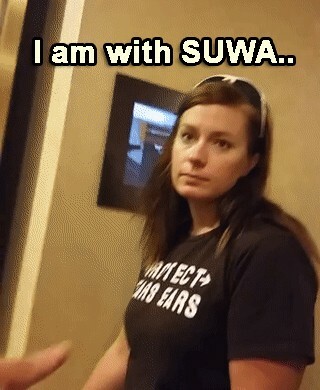 The second woman replies, “We’re with SUWA, sorry.” Then she walks in with no credentials. 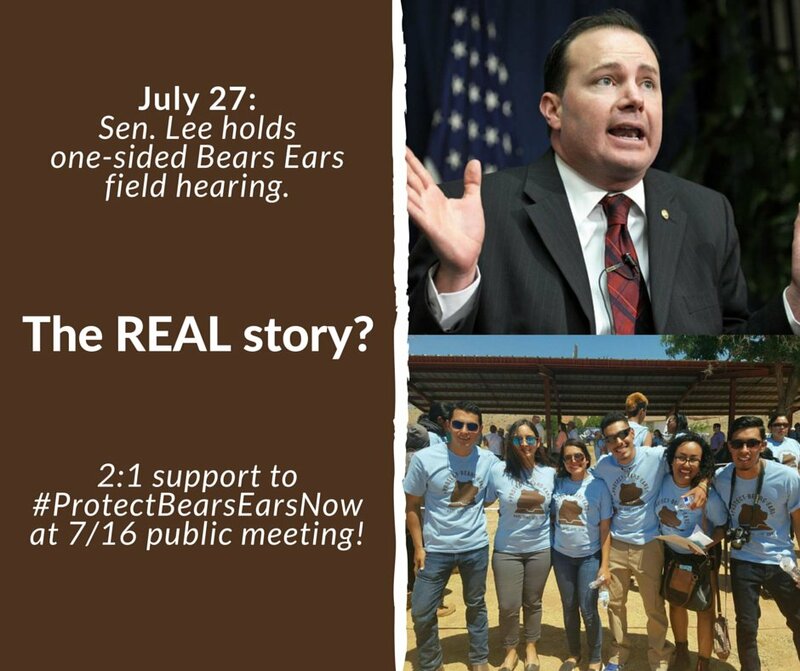 So, even though Senator Lee’s hearing was open to the public, supporters of the monument voluntarily didn’t show up. Then, in an act of narcissism, they claimed that without their presence at the hearing, the hearing couldn’t be legitimate. Now we have supporters of the monument organizing events that they advertise as open to the public, but when those who oppose the monument show up, they are told to go stand outside on the sidewalk. After all, you can’t have dissenting voices get in the way of your stated goal of pursuing an “opportunity to show a united voice.” So, call in the security guard and kick them out. Hipocrisy. Deceit. Propaganda. Corruption. Racism. Myopia. Narcissism. These are all good words to describe what is going on here. As disgusting and embarrassing as this behavior is, it is really just a microcosm of how the Outdoor Industry Association, their allies in the environmental movement, and the out-of-state Native American tribes that they have co-opted through generous donations of money want to manage public land. We’re always being told how our public lands belong to every American, and we are all invited to come enjoy them. But if we show up, and our idea on how to enjoy these lands differs from the dogmatic view of the environmental movement that provides the money, the human capital, and the moral legitimacy to those who want to restrict access to public land through national monument designations, then the invitation to come enjoy our public lands quickly turns into a polite invitation to stand outside on the sidewalk. If you’re not wearing the right t-shirt, if you’re not a member of the right tribe, if you don’t toe the company line, if you don’t have the ability to pay for access, then you don’t get to be part of the exclusive club of wealthy elites that have the sacred privilege of utilizing our public lands. These are just a few of the locals who oppose the corporate-driven Bears Ears land grab.